Starting today*, you’re going to be hearing me talk about SpaceUp a lot. You can go over to the SpaceUp site to see what it’s all about, but here, among friends, I wanted to talk about me. Erm, I mean, what it means to me. It started as one of those “why isn’t anyone doing this?” questions, which should be a red flag right there. As soon as I asked it, the answer was twisted into, “Yeah, Chris, why don’t you do that?” So I did what I usually do in that situtation: “Why don’t we do it, you and you and you and� don’t run away now! You.” I roped in people from both the BarCamp side and the SD Space side, so we have more than enough experience to actually make SpaceUp happen. Oh, but it means calling people! And putting myself out there! And asking people for money! And other scary things! So adrenaline is stomping on my nervous system and SpaceUp thoughts are constantly running through my brain just in case I’m Doing It Wrong. �but I’m not going to think about that right now. There’s plenty to do, and action is the best way I have to keep stray thoughts at bay. Oh, and you can pledge a few bucks to support an event with the potential to be awesome, and get a patch or a t-shirt to remember it by. 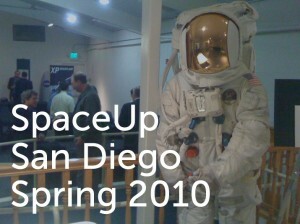 * Okay, I started blathering about SpaceUp to some of you a while ago. Today I stop holding back! For all the birthdays out there…. This is for Deb, Chris and Ben… Enjoy! Thinking of going back for that physics degree? Think ICL! And why not? Such illustrious stars (ha!ha! stars!) of the music industry like Queen’s Brian May, take time off from their busy touring schedule to complete Ph.D.s in Astrophysics at our fine facilities at Imperial College London. We are the champions, indeed. …but not necessarily in that order.� I’ll post another update when some or all of it is finished and ready to be praised.